This Iakovos is called the Less (Mark 15:40) by the Evangelists to distinguish him from Iakovos, the son of Zebedee, who was called the Great. He became the first Bishop of Jerusalem, elevated to this episcopal rank by the Apostles, according to Eusebius (Eccl. Hist., Book II: 23), and was called Obliah, that is, the Just, because of his great holiness and righteousness. Having ascended the crest of the Temple on the day of the Passover at the prompting of all, he bore testimony from there concerning his belief in Jesus, and he proclaimed with a great voice that Jesus sits at the right hand of the great power of God and shall come again upon the clouds of heaven. On hearing this testimony, many of those present cried, "Hosanna to the Son of David." But the Scribes and Pharisees cried, "So, even the just one hath been led astray," and at the command of Ananias the high priest, the Apostle was cast down headlong from thence, then was stoned, and while he prayed for his slayers, his head was crushed by the wooden club wielded by a certain scribe. The first of the Catholic (General) Epistles written to the Jews in the Diaspora who believed in Christ was written by this Iakovos. O wondrous Iakovos, God the Logos, only-begotten of the Father, who dwelt among us in latter days, declared you, the first shepherd and teacher of Jerusalem, and faithful steward of the spiritual mysteries. Wherefore, we all honor you, O Apostle. 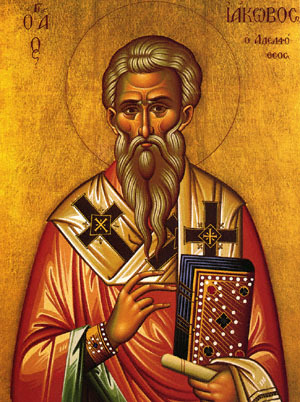 Share the feast of James (Iakovos) the Apostle, brother of Our Lord with an icon greeting ecard.